Fish keeping is a particularly attractive hobby, not least because it is dynamic and experiences add to the wealth of knowledge already amassed in books and online resources. Thus my fish keeping advice, opinions and information may change as new knowledge becomes available. These fish keeping articles therefore come with the obligatory health warning, i.e. there's no guarantee that the information is 100% correct! I hope that these fish keeping articles are read and assimilated in the spirit in which they have been freely published here. Please take a minute or two to visit the sponsor's links and banners as they have supported this site and allow it to operate. The Phylum Echinodermata contains several species familiar to many people- how many children don’t know what a starfish looks like? However, there are many members of this assemblage that are not so well known and some may be encountered by marine aquarists. Before we go on to look at individual species we will cover some of the unique attributes of echinoderms. Echinoderm Classes: Asteroidea - True starfish. Ophiuroidea - Brittle starfish. Holothuridea -Sea cucumbers. Crinoidea - Feather starfish / Crinoids. Echinoidea - Sea urchins/ Sand dollars/ Sea potato etc. 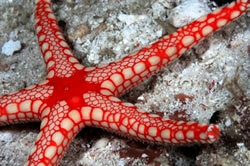 Echinoderm means literally “spiny skin”. This characteristic is due to the unique internal skeletal structure found in all echinoderms, consisting of calcareous ossicles, which are articulated in sea stars and rigid in sea urchins and contains a type of tissue termed mutable connective tissue. This can determine the rigidity of the echinoderms’ body and is especially useful for animals that utilise its versatility. For example some starfish need to be manoeuvrable and flexible but then when predating on hard shelled animals they may need a degree of rigidity when attempting to prise the bivalve open. As aquarists we can experience the incredible nature of mutable connective tissue by observing sea cucumbers - a group of echinoderms. Sea apples in particular can blow themselves up to relatively huge sizes (from tennis ball to football) in no time at all. It is reported that vigorous rubbing of a sea cucumber causes the tissue to become almost liquid- literally flowing through your fingers. Of course, this begs the question - why on earth would you want to do this but it is an interesting phenomenon nonetheless. Brittle starfish also exploit the properties of such tissue by shedding their arms when threatened - a phenomenon termed autotomy. Another important feature of echinoderms is their water-vascular system used in locomotion and food acquisition. We can see the tube feed of starfish on their underside and often all over the surface of sea urchins- both are governed by the water-vascular system. Damage to this specialised series of structures has been blamed for lack of success with some starfish in captivity. Echinoderms number some 6000 described species divided into 5 further classes as listed above. Of these the brittle stars have the most living species although the fossil record demonstrates that crinoids were extremely numerous and diverse many millions of years ago. Comatulid sea stars or “feather starfish” are sometimes purchased by aquarists due to their beautiful colouration. However, they are not suitable for the vast majority of marine aquaria and should be avoided. Crinoids are perhaps the only echinoderms we might not expect to encounter in a live rock based reef aquarium. True starfish have a variety of forms with the average number of arms being five but up to fifty are possessed by some species. In other species arms have become so shortened that the animal resembles a pentagon shaped pillow. Correct identification of closely related species is not straightforward and the taxonomist may have to resort to dissection to be absolutely sure of what they have. Fortunately, few asteroid starfish make their way into reef aquaria as accidental introductions. Those that do are likely to be from the following genus. These small starfish are termed “cushion stars” due to their chunky appearance and quite short arms. Colours vary and are not a reliable means of identification but the unifying feature of the species we encounter regularly in our aquaria is the slightly “chewed” look – almost as if something has been nibbling their legs! The numbers of legs vary although five appears to be average. In the U.K. we have an Asterina species called the common cushion starfish. This species is unusual in that it is not a broadcast spawner like most of the rest of the true starfish, instead eggs are laid under stones and rocks. If this is true of the reef specimens then this could explain why this species seems to thrive in aquarium situations although they are also said to reproduce through fission i.e. the splitting of the body into two. There are reported to be three species of Asterina that are commonly imported with live rock. The 0.5cm, whitish ones appear to be pure algal feeders. This is the species we are most likely to experience in our reef aquaria. There are two other species which I have only seen in reference books. One is vivid green and the other 1cm+ across the arms at maximum size. Both of these species are reported to predate hard and soft corals. Thus only prolonged observation of any suspicious-looking specimens will determine what you have. Indiscriminate removal will ease your fears but have you just dumped something quite useful? Given the potential for reproduction that Asterina shows in reef aquaria it is unlikely that the aquarist will ever control nuisance or harmful species of starfish by manually removing them, although this may be a valid technique if you can identify a potential problem early enough. One technique of biological control has been suggested involving the use of Harlequin shrimp. These beautiful crustaceans are obligate starfish eaters and so will ignore other foods. Asterina spp. are on the list of suitable foodstuffs for this shrimp but simply adding this species to your reef and expecting problems to disappear is naive. Biological control can work very well in a variety of situations but always relies on a pest population being controlled rather than eradicated- thus the pest species must always be present albeit in small numbers - okay if you don’t mind a few of your corals being scoffed rather than all of them. We have seen this situation before with the nudibranch Chelidoneura varia which predates flatworms such as Convolutriloba retrogemma. Once the pest population is drastically reduced the predator population starves to death. Then the risk is that the pest population recovers or further pests are reintroduced. I believe that in this scenario such a control technique is unethical but there could be scope for perhaps sharing predators amongst aquarists (good luck in catching the shrimp!). The other alternative is to culture Asterina elsewhere and feed your shrimp with them. Of course, it almost goes without saying that there must be no other starfish species present as these are likely to be attacked also! Starfish have remarkable powers of regeneration. Most species are capable of regrowing an arm, some detached arms are capable of regrowing a complete animal. Sometimes we experience individuals from a species that usually has only five arms – but they have six, or four or more or less! Thus counting legs is an unreliable identification technique. Many aquarists experience problems with starfish within a relatively short time. Many specimens seem to disintegrate, sometimes very rapidly, sometimes of a period of weeks. Reasons for this are unclear. Many aquarists first believe that this is the result of an attack by a crustacean or bristleworm but this is extremely unlikely to be the cause, although partially damaged specimens could be scavenged by such animals. Some sources state that it is due to poor handling and shipping, others that it is due to diet. It is possible that both causes produce similar symptoms but the experiences with these animals lead many aquarists to believe that all starfish are sensitive. Apart from the different Asterina species another type almost guaranteed to do well is a species of sand-shifting starfish probably a member of the Genus Asteropecten. These animals have become increasingly available over the past few years and many aquarists are using them to control detritus build up in their sand which can , if untreated, lead to cyanobacterial blooms (slime algae). This Class of echinoderms get their common name from the fact that careless handling or threat of predation causes the separation of legs from the body. As an escape response this mirrors the tactic used by several lizard species and the snail Stomatella varia which leaves the potential predator with a twitching morsel while the victim makes off rapidly and relatively unscathed. The brittlestar then regrows a new arm. Brittlestars are perhaps the most abundant of all echinoderms that arrive by accident in reef aquaria. The good news is that the vast majority of such specimens are totally harmless and can be encouraged. Some species, such as Amphioplus, reproduce asexually and reach great numbers if conditions suit. Most of the species we encounter are very small, however, we are often tempted to purchase larger specimens as they have a useful role in detritus consumption. I prefer the sand shifters for this as some species of brittlestar are not as innocuous as they first appear. For example the green brittlestar, is a commonly kept species that can breed readily in home aquaria. It performs a useful role in many aquaria as it will take uneaten food from the substrate and becomes very tame with time. However, this species has a sinister side too. Each arm is lined with elongated spines, similar to those in other species. However, used in the right way the starfish is in possession of an excellent trapping mechanism. Lifting its circular body clear from the substrate the brittlestar forms a shaded area which seems to appeal to fish which move innocently underneath. The brittlestar detects this and springs its trap move quickly downwards and bringing the legs together. The spines form a cage and the fish, if has not been alert enough, is doomed. Copyright © 2007 Tristan Lougher - All rights reserved.